Pendulums are a tool that can be used to access your Higher Self for guidance, clarity and helps us find answers to questions we may have. I have used a pendulum to check on which foods are good for me, to find an answer to a yes or no question, to see if my chakras are balanced, and to scan a room for energetic imbalances. I have observed shoppers pull out a pendulum at the grocery store and use their pendulum to help them make choices on which food would be best for them. It has been documented that Winston Churchill, Albert Einstein and General George S. Patton used pendulums to help them make decisions. Pendulums are easy to make. You can use string, chain or piece of thread as a pendulum by sliding a weighted object through it such as a pendant or needle. You may also purchase one from a metaphysical/new age store. 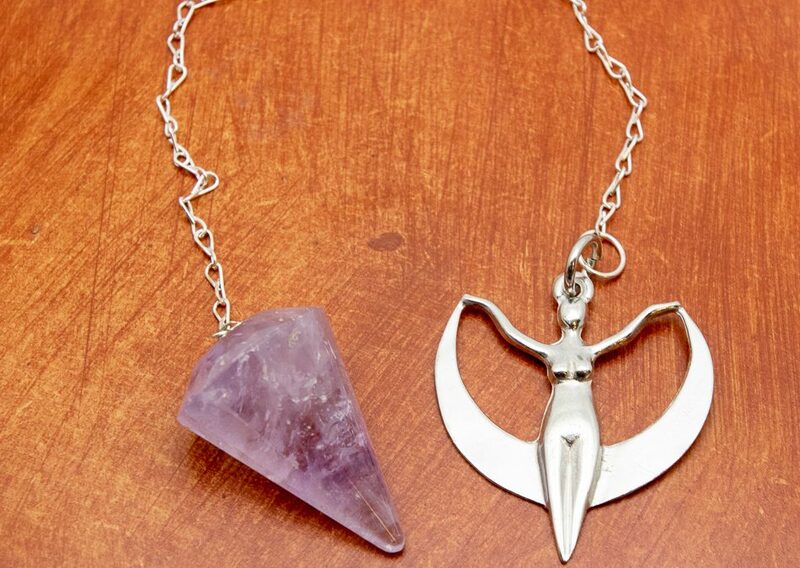 When purchasing your own pendulum, it is best to test and see with which pendulum you connect with. It might move automatically when you come near it, or you might even hear it call to you. It is usually best to select your personal pendulum in a store rather than online. You can test the pendulum by watching the movement as you use it in person to see which one is volunteering to go home with you. I suggest that you hold the pendulum in one hand and place the other hand underneath the pendulum. Ask the pendulum: please show me my “yes.” Then ask, please show me my “no”. If you do not know what your “yes” or “no” looks like, then you would ask the pendulum to show you. A “yes” can go back and forth, up and down, or even clockwise and counterclockwise. Take note after you request to be shown your “yes”. Next, ask to be shown your “no”. It should move in another direction. Very rarely will your “yes” or “no” change direction. After purchasing the pendulum, it is best to cleanse it with sage, a prayer, or by simply putting it in sea salt without water. After you connect with your pendulum, I highly suggest that no on else use your pendulum. If you are the sole user of the pendulum, it will work more efficiently for you. If has only your energy on it. I always work with an intentional prayer before using my pendulum. Here is a sample of a prayer to connect with your guidance (Higher Self): I request that all information, guidance and answers come from my divine source. I clear myself of all outside influences and trust the answers are being channeled through my Higher Self. When receiving an answer, trust the answer. Please do not keep asking the same questions more than once. When you don’t trust the answer, it brings doubt into your work with the pendulum and your results will be confusing and may not be accurate. Do realize there will be times when you are unable to receive a clear answer, if this happens, move onto another question. It may be time to put your pendulum aside. There is always the risk of using your pendulum too much and becoming dependent upon it. Please use your pendulum with caution and discernment. It does help to have questions prepared ahead of time when you are using your pendulum for a personal question and answer session. Be specific with your questions and be prepared to ask several questions in order to receive clear information regarding the area in question. Allow the pendulum to fully stop all movement before moving on to the next question. Am I going to move within the next 5 months? Would it be beneficial for me to move from my current residence within the next 5 months? Am I allergic to wheat at this time? Am I going to move? Am I ever going to be happy? Be sure you are in a clear frame of mind, relaxed, and emotionally and physically grounded. If there is a strong emotional attachment to the subject area in question, you may not receive clear and accurate information. Keep a notebook handy to write down your questions and your pendulum’s response as well as names and dates for documentation. Clear your pendulum often with sage, prayer, or sea salt. Have only your energy on the pendulum, no sharing. When I am through working with my pendulum, I close with a prayer of gratitude, for example: I thank my Higher Self/Higher Guidance for the assistance today. Thank you. I store my pendulum in either a bag or on top of a crystal. There are many people who carry their pendulums with them wherever they go. This is a personal choice. If a pendulum should break, the energy might still feel the same for you. Only you will be able to tell if the pendulum still “feels” the same. There are many different uses for personal pendulums. I have listed a few ways that I use my pendulum in my personal and professional practices. I encourage you to explore, and have fun as you experiment with your own pendulum.